Tis the season for colds and the flu, how are you going to prevent these health issues from getting to “YOU”! My first line of defense is to build my immune system with healthy foods and herbs such as nettles, echinacea, milk thistle and dandelion. When we build a strong immune system, that affords our adrenals to work properly, then the liver is not be overburdened and our bodies defense system can combat all the germs that we can come in contact with on a daily basis. 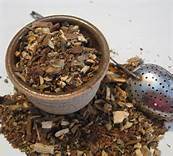 I like to make up an herbal tea, which I drink every evening with mint, nettles, echinacea, milk thistle, dandelion root, and ashwagandha. I call it my “Cold Night Tea”. I also eat at least two fruits a day to build up my vitamin C count. If “heaven forbid”, I start with a scratchy throat, slight cough and all over feeling of being rundown. I start taking an evening hot bath with some “Thieves detox Bath Salts” . Thieves is made up of four culinary herbs all with anti viral medicinal properties. Tomorrow I will share the four Thieves Oil recipe with you, so that you can make this at home. I will be making up some today in the shop- stop by!